A dual-state AMBER Alert has been issued in response to a reported abduction in Kansas City on Thursday of 15-year-old Brajean Sledge. The suspected kidnapping, which appears to be random, stems from a shooting reported around 5 p.m. Thursday at 2711 Elmwood. According to police spokesman Jacob Becchina, the victim’s grandfather heard a loud noise and discovered an unknown man standing in the home on Elmwood. The grandfather told police the suspect might have been shot. Moments later, the suspect disappeared, along with Sledge and a family vehicle. The getaway car was found abandoned this morning in south Kansas City. Detectives are actively canvassing for witnesses and Crime Scene officials are processing the vehicle for possible evidence. Updated information has prompted law enforcement to issue the alert for both Missouri and Kansas. 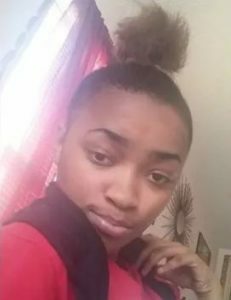 Sledge is described as a black female, age 15, hgt 5’08”, 125 lbs, with black hair and a blonde weave, brown eyes, last seen wearing a white V-neck shirt and dark pants. The possible suspect is described as a black male, hgt 5’7”, 18-20 years old, last seen wearing a gray hooded sweatshirt. The suspect should be considered armed and dangerous. If anyone sees the child, suspect, associate, or has information related to the Amber Alert, dial 911 to contact the nearest law enforcement agency or call the Kansas City Police Department at 816-234-5000.